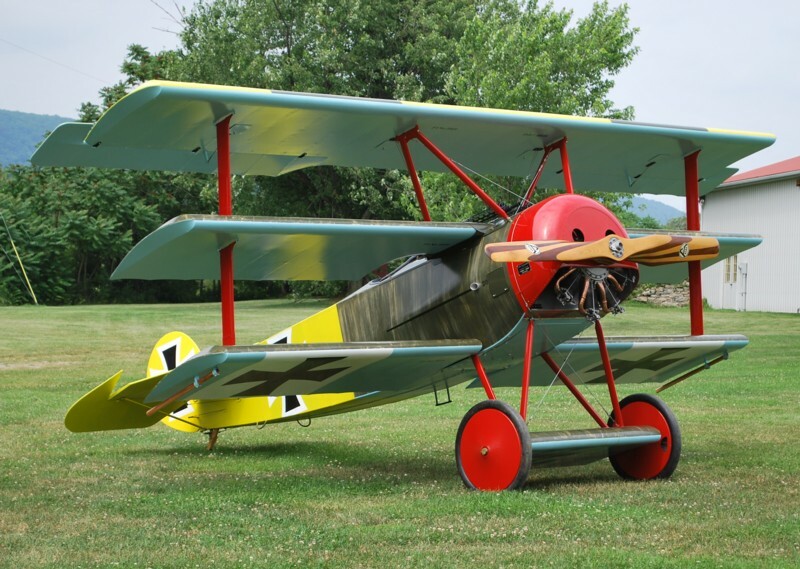 The Fokker DRI Triplane flew for the first time on July 2, 2011. Click here to view a takeoff video. Country: Germany Wingspan: 23' - 7"
Year: 1918 replica Length: 18' - 11""
Horsepower: 80 Gross Weight: 895 lbs. Designed by Dutch designer Anthony Fokker, the Triplane was Germany's response to the new Sopwith Triplane that appeared over the Front in early 1917. By late 1917 The Dr.I Triplane was in full production by the Fokker-Flugzeugwerke and wreaking havoc over Europe in the Great War. Although its time in operation was very short the Triplane was the most iconic airplane of World War I. Manfred von Richthofen "The Red Baron" scored many of his 80 victories in a Dr.I and his life was lost while flying one. Built from scratch by museum volunteers the triplane has an authentic rotary engine and is built to full operational condition. It is painted in the colors of Lothar von Richthofen, brother of Manfred, who also served in Jasta 11. Lothar scored 40 victories and survived the war. All materials on this Web Site (as well as the organization and layout of the Site) are owned and copyrighted by Golden Age Air Museum. © Copyright Golden Age Air Museum, 2005. All rights reserved. No reproduction, distribution, or transmission of the copyrighted materials on this Web Site is permitted without the written permission of The Golden Age Air Museum. Send mail to Contact Us with questions or comments about this Web Site.